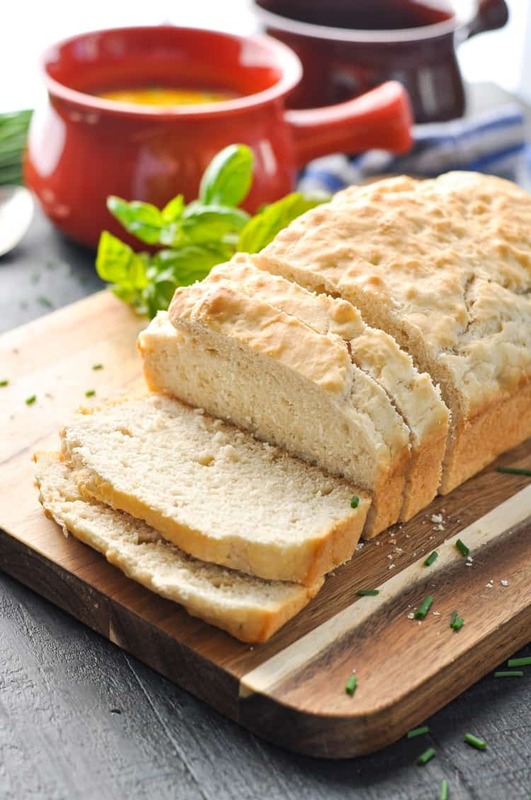 No baking skills are needed to make this super easy beer bread. It's made with only 3-ingredients and requires no kneading at all. Soft and delicious! You don’t need any baking skills to enjoy a fresh loaf of homemade bread hot from the oven! 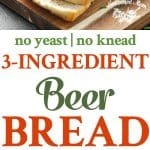 This no-knead, no-yeast 3-Ingredient Beer Bread is the quickest, easiest, and tastiest loaf that you will ever prepare. Does your family love bread as much as mine does? My boys would be happy with nothing but fresh buttered bread and a glass of milk for dinner every night, so clearly this 3-Ingredient Beer Bread is a huge hit in our house! Yes, that’s right — my kids love something called “Beer Bread.” But trust me — it doesn’t have a strong beer taste! The rich, full-grain flavor is balanced by a little bit of sweetness, making it perfect with savory dishes like soup and chili, and equally tasty when toasted with butter and jam for breakfast. 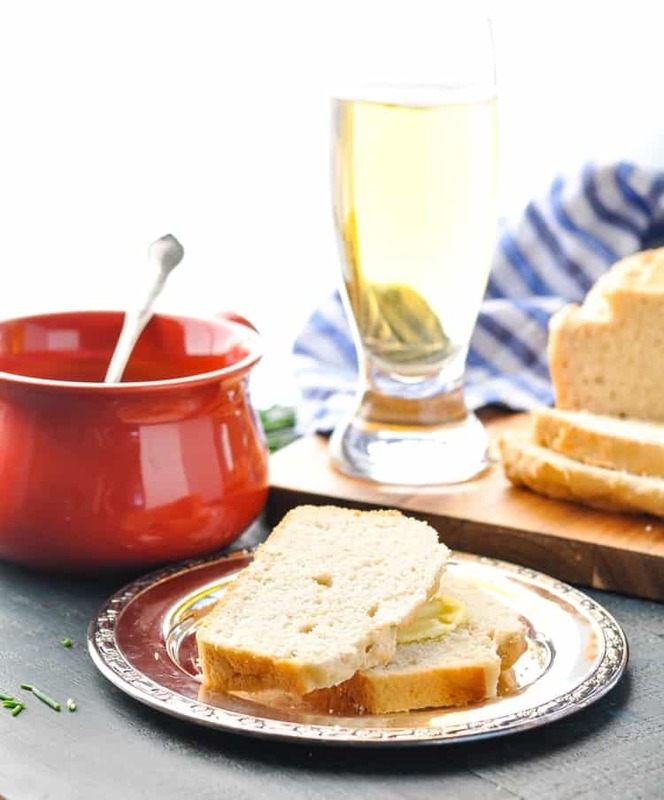 The beer bread comes together with 3 basic ingredients, which you can keep in your pantry for any last-minute bread cravings! 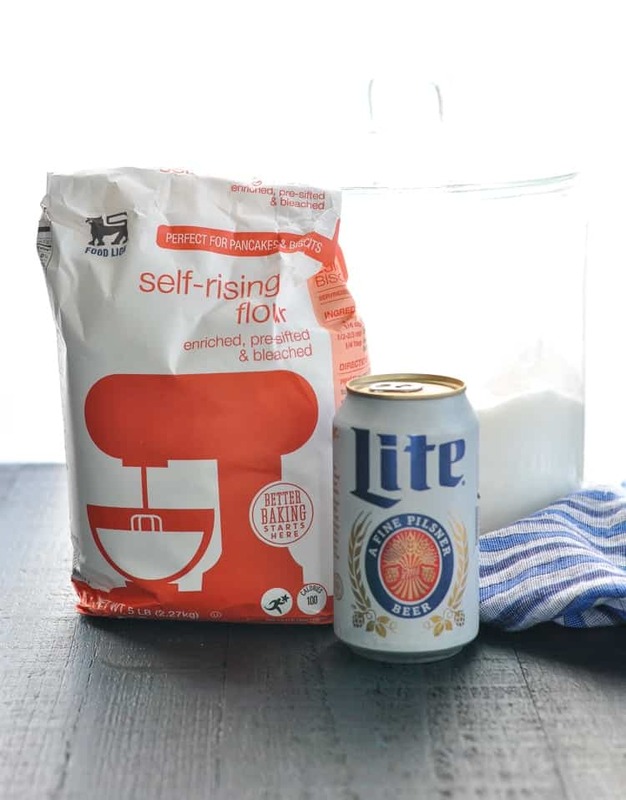 You literally just stir together the self-rising flour, the room temperature beer, and the sugar and your work is done! 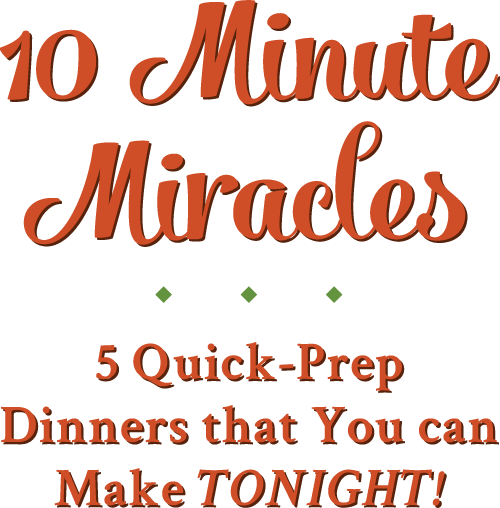 Five minutes of prep, you guys!!! The yeast in the beer helps the bread rise, and you don’t even have to knead the dough! Preheat oven to 350 degrees F. Spray a 9 x 5-inch loaf pan with cooking spray and set aside. 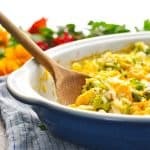 In a large bowl, stir together all of the ingredients until just combined. Transfer dough to the prepared loaf pan and bake for 45 minutes (or until a toothpick inserted in the center comes out clean). There’s nothing better than the smell of bread baking in the oven, is there?! You can create a cozy, comforting ambiance, sit back and relax, and enjoy a slice of warm bread with melted butter just a short time later. A loaf of my 3-Ingredient Beer Bread would be a perfect treat to share with your favorite teacher, neighbor, coworker, or relative this season. Homemade Christmas gifts are more flavorful, more affordable, and often more thoughtful than anything that you can buy in the store — and this bread is no exception. Best of all, it’s easier to stir together this beer bread dough than it is to brave the local shopping mall during the month of December! You can omit the sugar if you prefer but it does give the bread a lovely flavor. You can adapt the flavor of this bread by making it sweet or savory. 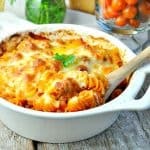 Try adding raisins or cinnamon for a sweet bread or dried herbs, cheese or cubed ham for savory. Leftover bread will store well in a cool dry place covered in plastic wrap or foil for up to 5 days or longer. You can breeze this bread and easily defrost it in the oven or broiler. Whether you consider yourself a “baker” or not, this is one project that you can tackle. Trust me — this is coming from the girl who uses refrigerated cookie dough and boxed cake mix 90& of the time! 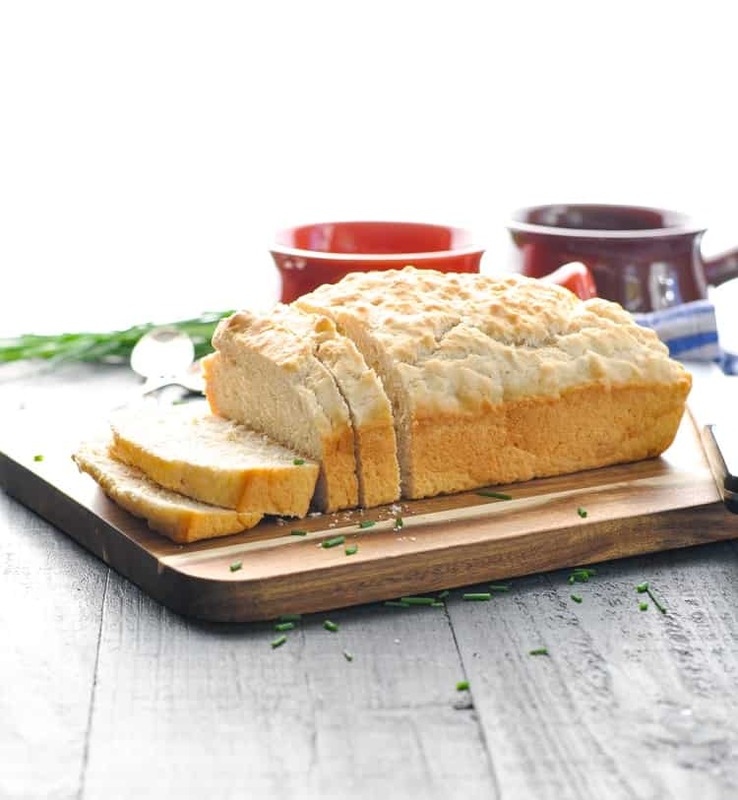 But wow, this beer bread is so much better than anything that you could prepare from a package! I noticed you used a can of lite beer. Do you taste the beer? Hi, Barbara! No, it doesn’t matter at all. I used the Miller Lite because that’s my personal preference so that’s what I had on hand. With a light, mild beer you definitely don’t taste it. 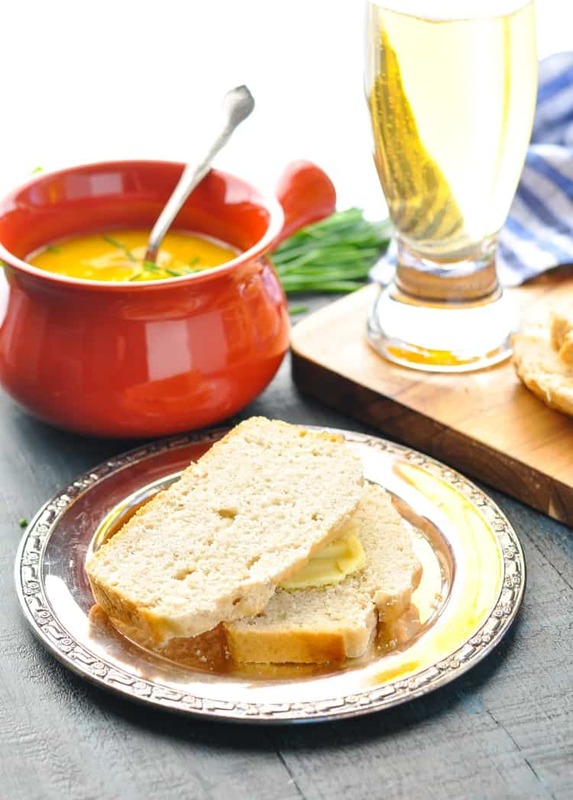 The beer gives the bread a “yeasty” flavor, but not a strong beer flavor. If you want a bit of beer flavor, then I would use a darker, stronger beer. It still won’t be overpowering, but you’ll get more of that beer taste. Hi, Sandra! Yes, the bread can definitely be frozen after baking. Just allow it to cool completely and then wrap tightly. Enjoy! No bread recipe out there ever uses eggs. You are wrong. Beer has yeast in it. I know that. 🙂 I said in the post that “the yeast in the beer helps the bread rise.” When I noted “no yeast” on the image, I meant that you don’t need to use an active yeast packet and take the dough through the rising process. Just read the post a bit closer next time before criticizing, please. I understood what you meant by no yeast right away! Thanks for the recipe. I’m making it now – without the salt. Almost wish I’d have put it in. Guess I’ll have to make it again! 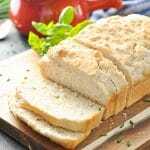 This bread also makes good homemade garlic bread. Just find a good recipe for garlic spread and you’ll never buy frozen garlic bread again. I don’t get it. No matter what recipe I use with self-rising flour, it never ever rises at all and comes out heavy and dense. I followed this recipe to a T and the results are the same. Would it help at all to add baking powder? If I buy a pre-packaged box of beer bread mix at Walmart, it turns out perfect every time. I just can’t figure out why the bought mix turns out great but homemade from scratch doesn’t. Hi, Russ! I’m honestly not sure why it didn’t work for you. 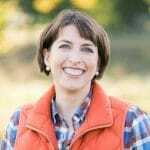 Is your self-rising flour fresh? If the active ingredients are old, they lose their effectiveness and can result in a baked good that doesn’t rise properly. Also, you want to be sure that you’re not overworking the batter before baking. 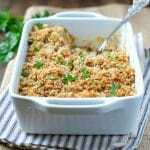 As with muffins or any other quick bread, too much stirring, kneading, or overworking will cause the final product to be dense and dry. You just want to gently fold everything together until it’s barely combined. Maybe those tips help? I love making this bread. Always make it with corned beef and cabbage on St. Patty’s every year. 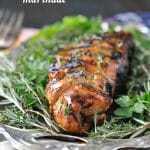 I add rosemary to mine and the recipe I have also calls for pouring melted butter on top. While it tastes yummy, mine looks lumpy an not smooth in the middle. Yours looks more smooth like a loaf of bread. I wonder if it’s because your flour is presifted or maybe because my recipe calls for butter poured on top? Do you think either of those would make a difference? I’m definitely going to try making it your way. Hi, Chris! I wouldn’t think that the butter on top should change the texture too much, but I do think that the pre-sifted flour could make a significant difference. I would try using pre-sifted flour next time (or just sifting your own flour) and see if that helps. 🙂 The rosemary sounds like a delicious addition! This sounds soooo delicious, what a great idea to use beer instead of yeast.